?Easily decode ADSB Aircraft data information on 1090 MHz . 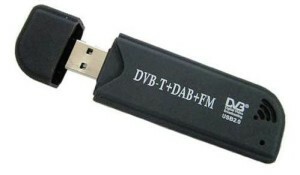 All you need is a TV USB Dongle that has the Realtek chipset and covers DVB-T, DAB & FM radio. In conjuction with a computer laptop or desktop and the appropriate decoding software, it possible to monitor local Aircraft traffic on a map display in real-time.? Of course the interesting bit is how far you can receive the vertically polarised data signals from your location and how you can increase the distance of contact with aircraft with home made antennas of various designs. Best value:?$8 generics from China. Build a Coketenna, be merry for less than $10 – a $150-dollar rig won’t get you 15x more fun. Or 15x more data. Best ADS-B receiver only:?blue FlightAware Pro Stick Plus. On its own, or in this test, continues to amaze. Best ADS-B receiver only with general use in mind:?orange FlightAware Pro Stick. Onboard LNA for $17 is priceless for weak data signals – if ADS-B, weather satellites, pagers etc are your game along with casual listening, get an orange FA Pro Stick. Best plug-n-joy bundle:?Nooelec SMArt. Longest supplied coax cable on the market, shortest of three supplied antennas good for ADS-B, quality in every detail – less than 1% between four dongles, need to say more? Thirty dollars for a SMArt bundle is an uncontested long-term investment in radio. This entry was posted in ADSB Aircraft Monitoring, CB-Radio-Hobby, Radio-Scanners, SDR CB BANDSCOPE by 43AX05. Bookmark the permalink.